Facials do not mean pampering tour skin for a few hours. Facial has become a necessary now because of our lifestyle. There are many facials available in the beauty parlours. Other than the usual fruit, gold and diamond, a number of other types of facials are also there. You can choose facials according to your skin type. You can even try some offbeat facials like the Galvanic facial. Galvanic facial is a process in which direct galvanic electrical current is used to introduce water soluble substances through the surface of the skin. This helps in improving the absorption of ingredients and retention of moisture in the skin. Galvanic facial treatment is best for people with dry and dehydrated skin. It can also be beneficial for those with oily skin because of its effective removal of congestion. It boosts the effectiveness of any skin treatment. Since water soluble substances are presented to the skin, it helps in increasing the ability of the skin to absorb. As a result, the active ingredients of the facial as well as the skin products are allowed to penetrate deeper in to the skin. It also increases moisture retention, so it is great for people having dry skin. If you have problem skin, then also this facial is effective as it is targeted at getting rid of clogged pores. This way the oil content in the skin gets reduced, thereby preventing acne breakout. Galvanic facial is also a great anti-aging treatment. Aging not only makes your skin dull and leads to the appearance of fine lines and wrinkles on your skin, but it also makes your skin rougher in texture. Galvanic facial helps in easing the muscles and tissues of the skin, which otherwise may go stiff with aging. When the muscles are relaxed, they carry more oxygen and blood. With increased oxygen and blood transportation, the pH level of the skin is restored. This way your skin becomes baby soft in a few sittings. Galvanic facial allows the anti-aging ingredients in treatment gels to penetrate deeply into your skin. This is because of the galvanic current and positively charged product. The deep tissue is where the good products work their best. Just applying the product on the skin does not make it work effectively. The first sign of aging is the dullness of the skin. If you do not prefer to go for expensive surgical methods to regain your youth, galvanic facial is one of the best options for you. This facial is a new form of the traditional facials. It needs you to sit only for 10 minutes. This facial increases the oxygen content in the skin thereby removing the dullness from your skin. Age lines are deep cracks on the face. These appear due to the wrinkles on the skin. These age lines are quite hard to cure. You should not ignore these age lines. Galvanic facial is a very effective way to reduce the fine lines. With regular sessions of this facial you can reduce fine lines over a period of time. Along with reducing the aging of the skin, galvanic facial also helps in providing you a lighter skin tone. It is a unique electrical facial and it focuses on destroying the toxins harmful for the skin, mainly those responsible for aging of the skin, in a natural way. The negative ions, which trap all the skin toxins and impurities, are de-rooted form the skin with the second phase of galvanic facial. In the second phase, the negative ions are attracted with a splash of positive charge from the other end. This in turn provides you clean skin that is free from the toxins. It also makes your facial skin free from acne and provides you fairer complexion. Getting even the best moisturizing cream for your skin to beat aging can still make your skin look aged. Galvanic facial on the other hand helps in increasing the skin’s response to aging. As you know, galvanic facial procedure helps in enhancing the production of collagen and fresh skin cells. The old and dry skin cells give way to healthy skin tissues. This facial also increases the circulation of blood in the face. With an increased blood circulation, there is increased supply of oxygen to your face. Oxygen is very effective for making your skin tighter and fresh looking. It also restores the moisture content of the skin. As you age, your skin tends to lose its elasticity. This leads to the appearance of wrinkles on your skin. By going for Galvanic facial, you can restore the elasticity of the skin on your face because in this method a low DC voltage is induced in the skin. It helps in increasing the ability of the skin cells to reproduce and multiply. As a result, new skin cells are formed, which replace the old, wrinkled and tired skin cells. This makes your skin firm and tight. Your skin will look supple, soft and young. One of the best ways to give an anti-wrinkle treatment to the aging skin of your face is to go for Galvanic facial. The wrinkles reduce when you have Galvanic facial because of the electric boost given to the skin. The chemical imbalance in the human body is also a reason for premature aging of the skin. 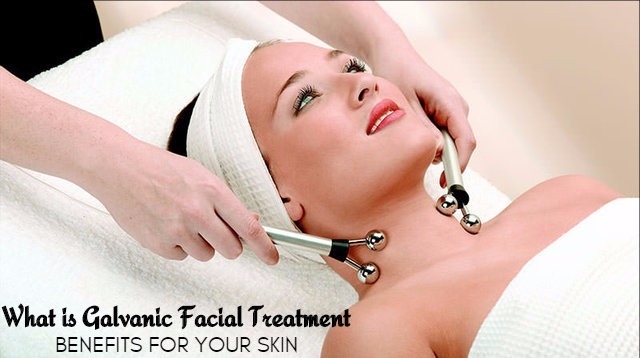 Electrical boost of Galvanic facial helps in tightening the skin cells of the face. Tight skin means lesser wrinkles. So, you can see that galvanic facial promises you to make you younger with clear and fair complexion.